Please check this box if you agree with the Terms of Service. The simplest way to send a large file. 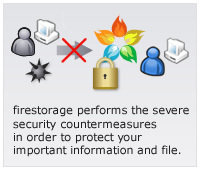 firestorage makes it easy to upload and download a file. You can send a large file without email limits on file size. Just two steps to upload a file. Copy an issued Download URL and paste it into your email to those whom you want to send. The person who received a Download URL can access and download a file from their browser.